Tablets like the Samsung and the iPad have revolutionized the way we think about computers. They're easy to carry around and just as easy to use. In turn, they have revolutionized the way we think about books. Suddenly, it's easy to carry your whole library with you wherever you go and find new books to add to your library from the Internet. But what about musicians? Can they take advantage of the innovations tablets bring with regard to sheet music? No more heavy books, no more bulky binders. When you convert your paper sheet music into digital files, you can leverage the storage power of tablets and computers. In fact, the smallest iPad (16 GB) can carry the equivalent of 700 pounds of paper or tens of thousands of pages of sheet music. 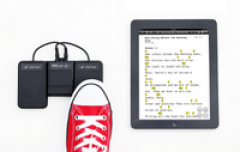 With tablets, you can literally carry your entire sheet music library with you wherever you go. Think of how much time you lose looking for that song buried under stacks of books. With digital sheet music, you can find any song in your library faster than you can Google a recipe for making whole wheat bread from scratch. And with more and more sheet music available from online sites, you can find and add songs to your library way faster than you can drive to your local music store or library. The #2 pencil is probably the musician's best friend next to his or her instrument, used for marking up music with fingerings, bowings, rhythmic reminders and even note names. With digital sheet music, not only can you mark up your music as easily as pencil on paper but you can do so with bright colors and highlights, and erase those markings easily without damaging the page. The size of your music is only limited by the size of your tablet or computer screen. Even with the iPad, whose screen is smaller than a standard piece of paper, you can find several apps that give you the option to turn the screen on its side, giving you a zoomed in view of your music half a page at a time. There's even an app that will let you create custom views of your music showing just a few measures at a time for mega-zoomed views.